There’s a lot of Life left after a crisis; believe me, a lot of Life! Often when in the throes of a crisis, we think we cannot go on. We don’t see a way out of whatever we are faced with. And we think it’s all over. We want to give up. But just remember this – failure or defeat is temporary, it is giving up which is final! On Sunday, I was in a conversation with the world-famous pianist Anil Srinivasan. 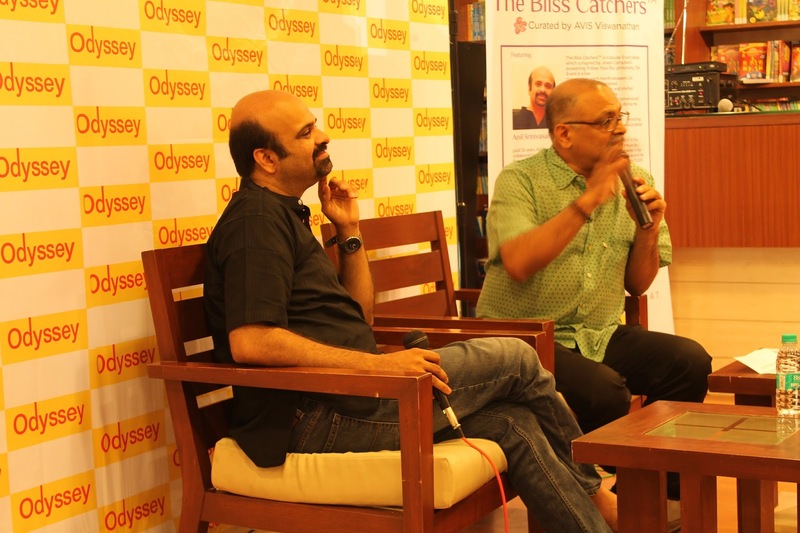 This was part of a monthly Event Series I curate called “The Bliss Catchers” which is hosted by Odyssey, Chennai’s most happening bookstore. The Series celebrates people who have had the courage to let go of “safe and secure” careers to follow their bliss, to go do what they love doing. Over the course of our conversation, Anil shared his story of how he found and followed his bliss. Anil’s heart was always in the piano – he started playing it when he was just three years old; in fact, the piano is his Life. But family circumstances (a grave financial crisis had made it mandatory for him to pursue a career option that would be immediately economically viable and rewarding) and peer pressure forced him in the direction of an MBA at a US University. He followed that up with attempting a PhD at Columbia. But at one time, what he describes as his lowest phase, the PhD was just not happening. He had huge educational loans to repay. He had no money. And his academic career was going nowhere. One day, Anil, out of sheer desperation and depression, just blacked out. “I was going to a friend’s place in a cab in New York. But I just lost track of what I was doing. I did not know where I was or where I was headed. When the cab reached the destination, I told the cabbie I had no money to pay him. He kind of made out that I was losing it. So, he said that it was okay, he waived the fare, but he also urged me to take care of myself. I got down from the cab and I just slumped on the stoop in front of my friend’s apartment. I was still clueless of who I was, what I was doing or who I had come to meet. So I simply sat there and spent much of the night there,” recalled Anil. Later that week, Mandolin U.Srinivas (1969~2014), who was a good friend of Anil, called him. Srinivas was performing at Burlington (on the US-Canada border, in Vermont) and wanted to just say hello to his friend. From Anil’s depressive tone, Srinivas surmised that Anil needed help. Urgently.So, Srinivas rushed to Anil’s apartment in New York the next morning and urged Anil to take a walk along with him. The two of them walked along the Hudson for over an hour. Anil says that Srinivas was certain that Anil needed help. But more important Srinivas felt that Anil must play his piano. Immediately. “‘How long ago is it since you played the piano?’ Srinivas asked me. I had no answer. I had forgotten when I had played the piano last. That was how far removed I was from my beloved piano and my music,” Anil told me and the other guests at “The Bliss Catchers” Event. As it turns out, Srinivas took Anil back to his apartment and encouraged him to play. Anil just followed Srinivas’ suggestions without protest. In just a few hours Anil was playing beautifully, enjoying himself and was feeling “totally alive”. “Srinivas re-infused the gift of Life, my music, back in me,” Anil reminisced, even as a tear dropped from his eye. “I can’t believe Srinivas is no more,” he added. So, that’s how bad things really were for Anil Srinivasan – someone who, as much of the music world believes, is the finest pianist India has ever produced. Can you believe it? One of India’s best musicians was beaten by Life, was depressed and defeated just 15 years ago? And look at him today – he’s living the Life he truly wanted to live, he’s enjoying his music and he’s making music that everyone loves to hear. He’s traveling the world and making people realize that the piano is not just a Western classical instrument but one where it is possible to make any kind of music – from Carnatic to kuthu to Bollywood – if you play it from your soul! Anil’s story teaches us, yet again, something very, very important. It is the most significant lesson you will ever need to learn about living intelligently – that Life’s darkest moments must be faced. And no matter how dark it is, no matter how hopeless it is, every storm will pass one day. All you must believe, when you are feeling down and out, done in by Life, people, events and circumstances, is that there is a lot of Life still left, after each crisis. Author AVIS ViswanathanPosted on July 22, 2015 March 14, 2016 Categories Anil Srinivasan, Art of Living, Follow your Bliss, Inner Peace, Intelligent Living, Joseph Campbell, Mandolin U.Srinivas, New York, Odyssey Bookstore, Piano, The Bliss CatchersLeave a comment on There’s a lot of Life left after a crisis; believe me, a lot of Life!